Become an IPA sage by tasting four different hops and noting your impressions using Dave Selden’s kit. When you love someone, you want to know everything about them. The same is true if your beloved is beer. Dave Selden, who sports a beloved hop vine tattoo, created this kit so you can taste and learn more about IPAs and other hoppy beers. Just pour four ounces of a brewski (mass-produced, non-craft beer is ideal) into one of the two specially shaped tasting glasses, add a few drops of the hops concentrate you want to try, and taste. 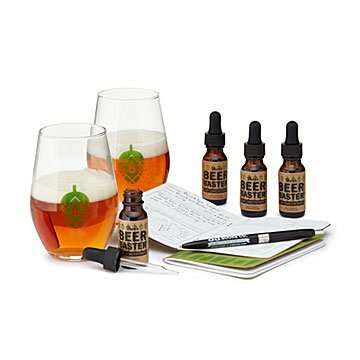 Write your impressions in the tasting journal, which has a "hops flavor wheel" (with choices like "bitter," "floral," "citrus fruit," etc. on every page). Soon, you'll be chit-chatting about "lupulin glands" (the flavorful parts of a hops cone) and "piney notes" with the best of the beer nerds. Store concentrates in a cool, dark place. Glassware can be washed in the dishwasher with mild, low aroma soap for best use.